Celebrate 4/20 with “No More” FREE DL from Touch & The Dirty Sample! It’s April 20th, the first 4/20 in Canada since marijuana was legalized. Touch & The Dirty Sample have the perfect song for just such an occasion. “No More” is off upcoming album Jawz, dropping April 26 on Hand’Solo Records. 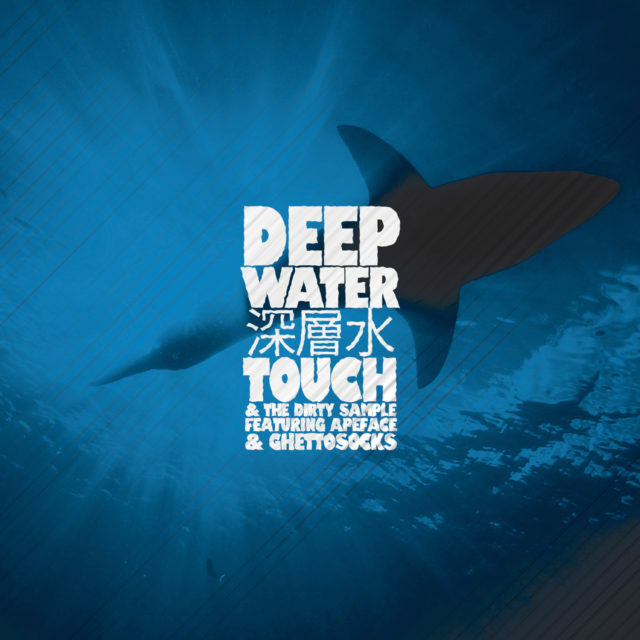 Over The Dirty Sample’s laid back, jazzy production, Touch celebrates our newfound freedoms and all the things we don’t have to worry about no more. The song is a perfect pairing with the date, so “No More” will be released April 20, ahead of the album, and is available free to download all day. Download “No More” and… let’s get high! Last year Hand’Solo Records finally released the long-awaited album from Psybo, Wherewithal. 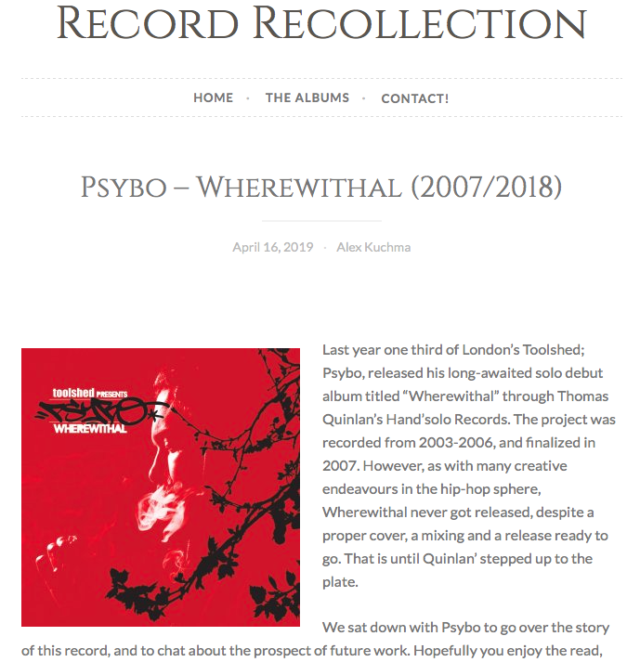 The historical hip hop blog Record Recollection did a little interview with Psybo regarding the album and its release. A great read for fans of Psybo, Toolshed, or the Backburner crew. 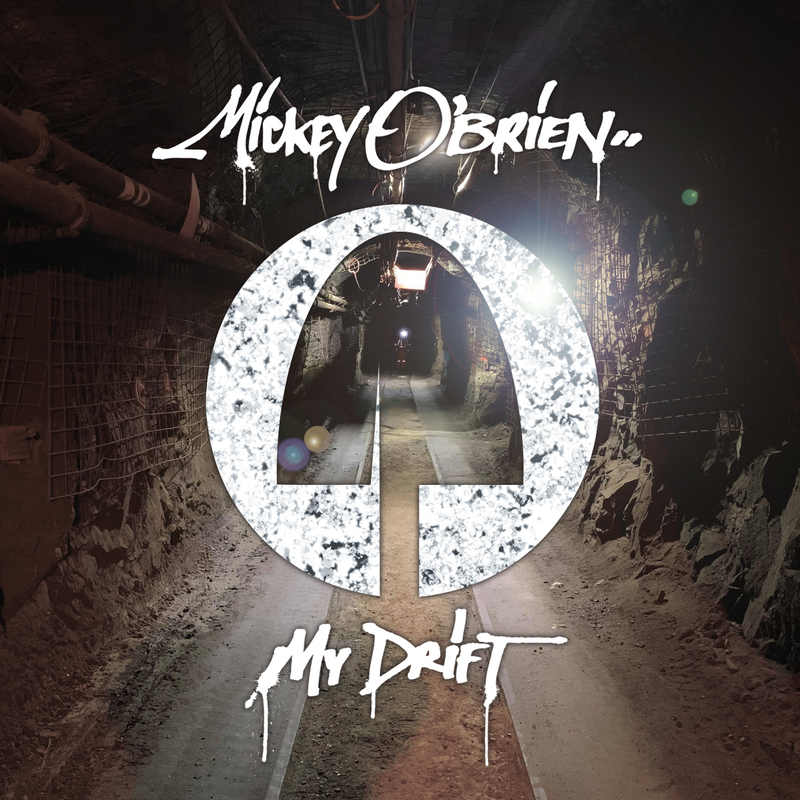 RapReviews really liked Mickey O’Brien’s My Drift! ‘Nuff said! Except for this whole review, of course… Or click the review or link at the bottom to read the review providing all the song links and video being discussed as any civilized music fan would. 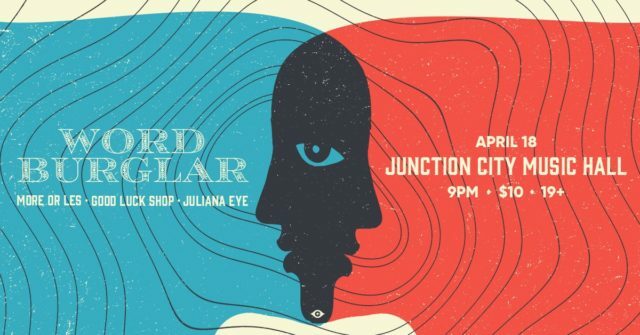 The first show is with More Or Les, Good Luck Shop, and Juliana Eye at Junction City Music Hall (2907 Dundas St West) in Toronto on Thursday, April 18. 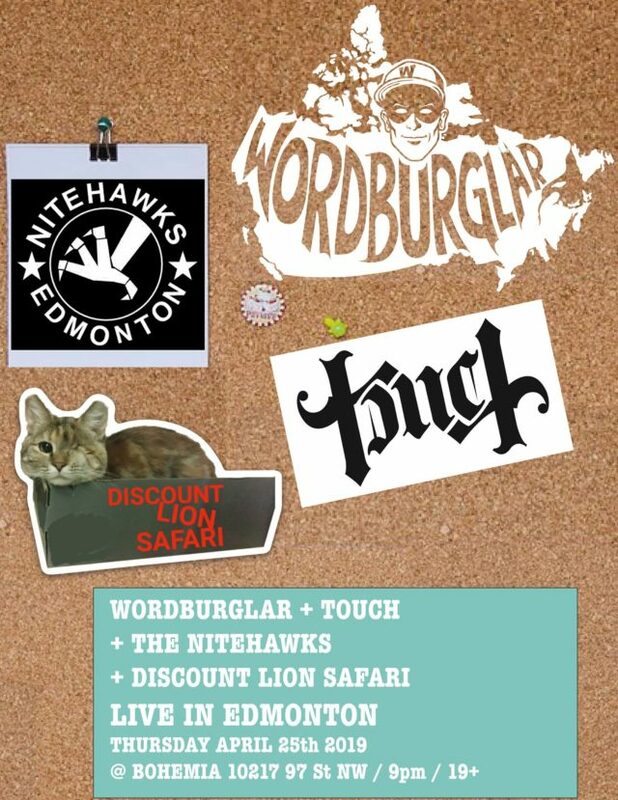 The second show is with Touch, Nitehawks, and Discount Lion Safari at Bohemia (10217 97 St NW) in Edmonton on Thursday, April 25. 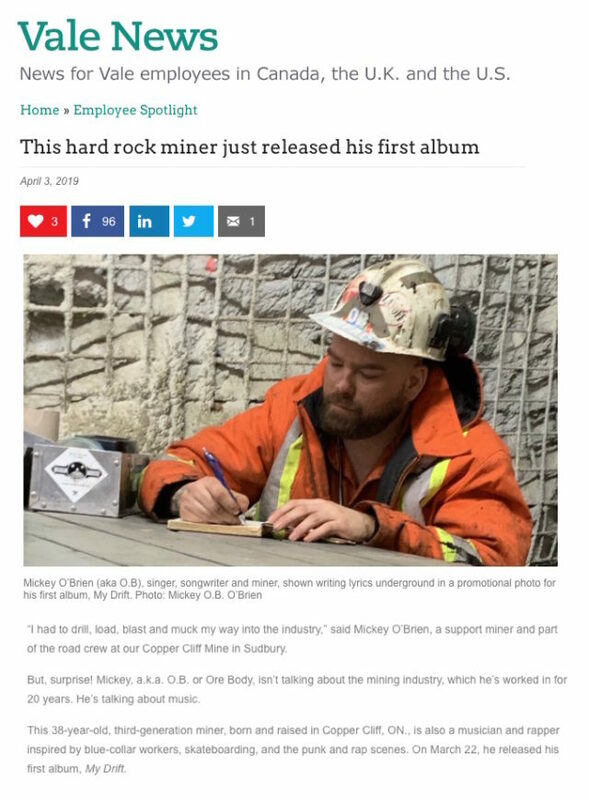 A third generation miner with INCO, now Vale, an employee spotlight from his company newsletter surely means a lot for Mickey O’Brien aka OB orebody. The opening of the article is posted below, but you can click the image or the link to read the full article. 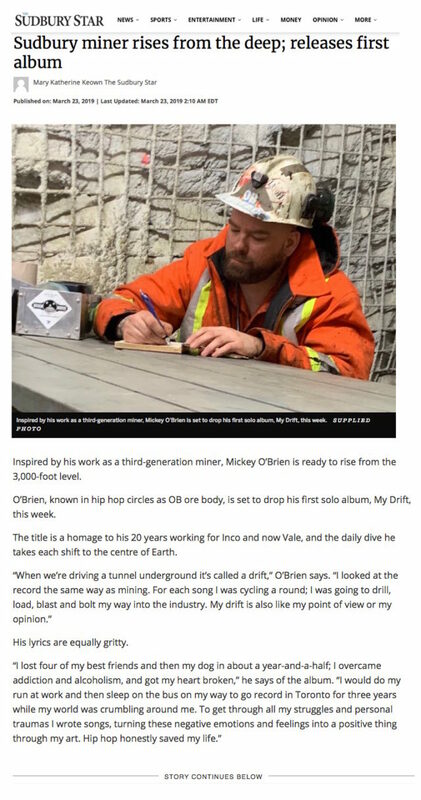 As a born and bred Sudburian before relocating to Southern Ontario, I’m very happy to see The Sudbury Star give some space to local rapper Mickey O’Brien. Only a portion of the article is pictured below, but you can read the full article if you click on the image or the link below. Mickey wants to celebrate St Patrick’s Day by giving away for free for that full day the title track from his album. “My Drift” is a shout-along Irish drinking song, a working class anthem, and an ode to lost family and friends. Dealing with personal trauma through music, by turning the negative into a positive, Mickey writes a song to honour the memory of four of his best friends and his dog, whose bark can be heard at the beginning of the song. With Celtic-inspired “East Coast loops” supplied by MPC button-masher and production master Fresh Kils, the result is a rousing yet touching drinking song! Available FREE FOR DOWNLOAD on St Patrick’s Day only!